Two thousand-year-old Guilin is one of southern China's prettiest towns, lying as it does on the banks of two rivers surrounded by amazing scenery. The city was named after the osmanthus fragrance due to the area's profusion of these trees and its oddly-shaped hills and karsts are the star attractions. While Guilin doesn't excel in the eating stakes, there is good choice to be had in among the shops of the street markets and in the food courts. All types of Chinese cuisine can be had, including local Guilin and Sichuanese dishes, while Western fast food joints can also be enjoyed. Guilin isn't really one for huge, standout, manmade sights or museums; it's better known for its natural scenery and its crafts shopping. The former is particularly impressive and several river tours take in the city from its best side. Li River cruises are all the rage and can be done during the day or at night. 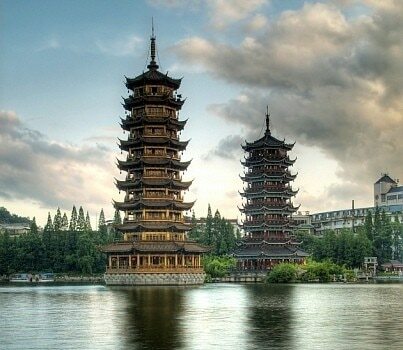 Guilin is a safe city, with low levels of crime and a fine blend of cultures from many areas of China. You need to be wary of pickpockets and menace children selling flowers, as with elsewhere in China, although most people have a hassle-free time. Getting around Guilin is chiefly by bus or taxi. Guilin is good for souvenirs and gems, and if you're on a China-wide tour be sure to wait until you get here if you're into southern Chinese goods. Best buys include Guilin Stone, which is a special type of bright and unique stone that was formed in this region of China.